Started by lewis505 on October 05, 2014, 12:07:50 PM in WHAT IS IT? Re: LB at Duxford last weekend ! Forum announcements will be in the main board (only forum staff), all others are identified by their sub-board title (all members). This board gives a quick link to the newest classified listings. This is not a discussion board. This board is for posting a record of published reference books. Either digitally or hardcopy and any member who has them and willing to share information. Just a place to post links to anything you feel can help another member or any interesting sites. This is just the start of developing the reference section. If you don't have a clue, feel free to post it here. Please post questionable militaria here for discussion. in Re: Glow or No Glow?? 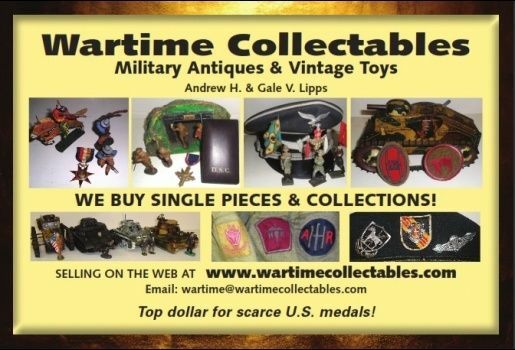 For displays of US Militaria in your home or office. All other types of displays need to go under the appropiate category with show and such. If worn by American's for training or in the field, it can be posted here. This is the all encompassing insignia for US Militaria. Please post in the appropriate sub-board but if you are unsure a moderator can move it from the main board. Everything insignia goes here. The support at home was as important as a smoke on the battlefield. This is where anything and everything Homefront related can be discussed and shared. As it says, groupings. The whole mix of items you have from a soldier or family of soldiers. Bringbacks are allowed to be posted in their entirety as part of a grouping ONLY. Items you wish to be not searchable by search engines can be posted in the named sub-board. US Only Awards and Decorations. Foreign awards issued to US veterans goes in their own sub-board. Named items can be placed in their sub-board as well if you wish it not to be searchable. Post them if you got them, all types worn by the US Military. Anything US without a home. For displays of British and Commonwealth Militaria in your home or office. If worn by the British or British Commonwealth for training or in the field, it can be posted here. British and Commonwealth Only Awards and Decorations. Foreign awards issued to British and Commonwealth veterans go in their own sub-board. Named items can be placed in their sub-board as well if you wish it not to be searchable. Post them if you got them, all types worn by the British and Commonwealth Military. Anything British and Commonwealth without a home. For displays of Russian Empire, USSR and Russian Militaria in your home or office. If worn the Russians when they were allies, for training or in the field, it can be posted here. As it says, groupings. The whole mix of items you have from a soldier or family of soldiers. Bringbacks are allowed to be posted in their entirety as part of a grouping ONLY. Russian/USSR Only Awards and Decorations. Post them if you got them, all types worn by the Russians/Soviets as Allies. Uniforms worn by the Russians/Soviets as Allies. Antyhing Russian or Soviet without a home. An area to share enemy items brought home by Allied servicemen and women. All items shared should be linked back to an allied veteran in some manner. Please do not use this area to share your collection of non-Allied militaria. US, British, and Allied aviation flight clothing, equipment, ect... can be posted and discussed. Insignia and dress uniforms need to be posted in those respective nation's board. Anything specifically related to the Cold War can be discussed here. All countries involved can be discussed and militaria shared. US, British, and Allied weapons that have an edge. If it was made for cutting, dicing, poking, stabbing and killing...post it and discuss it here. US, British, and Allied ephemera and photographs can be posted here and discussed. The gallery (tab located at top of page) is also a great place to display your photos and tag key words for reference later. For all US, British, and Allied Identification papers and tags. PLEASE BLUR SOCIAL SECURITY NUMBERS! If it goes bang in one way or another, discuss it here. All US, British, and Allied pieces. Any Allied militaria not covdered by individual sections can be posted and discussed here. Woman have a long history in the military and proudly wearing the uniform for their country. This section is dedicated to any female militaria and contributions to the US, British, and Allied military. For US, British, and Allied vehicle, vessels, and aircraft. If it has a motor, discuss and share it here. The place on the forum where all non-militaria conversation can take place. Check out the sub-boards for The Coffee Table (reviews of different media), Shills 'n' Thrills (exclusive eBay/auction talk), and The News. Talk about your other hobbies and interest here. Anything goes, that is legal in your country. Click the CLASSIFIEDS tab at the top to see FOR SALE listings. This section is for posting wants, trades, and item assessment requests. Also any dealer or seller can post their store (eBay, etsy, webpage, ect...) link as a courtesy advertisement for being a member.